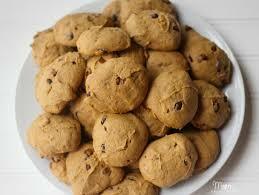 Home DIY Cooking On A Budget Cooking On A Budget: Scrumptious Cinnamon Pumpkin Chip Cookies! If you love fall treats, you have to give this simple and delicious recipe for Cinnamon Pumpkin Chip Cookies a try! Use a bowl with a stand mixer to mix together butter, sugar, eggs, vanilla extract, and cream cheese on a medium-high speed until it becomes fluffy (it takes approximately 5 minutes). In a separate bowl, whisk together the flour, corn starch, baking soda, salt, and pumpkin pie spice. Add the dry mixture to the wet mixture gradually. Then, use a spoon to stir in the cinnamon chips. After this, you must cover the mixture and allow it to sit in your refrigerator for 30-60 minutes. Next, preheat your oven to 350 degrees Fahrenheit. Place parchment paper on your baking sheet, and roll the dough into small balls (approximately 1 1/2 tablespoon of dough per ball). Bake the cookies for 8-10 minutes. Allow them to cool, and enjoy!